Many older Americans have little to no savings to get them through their retirement years, according to newly released government data. Meanwhile, the slow demise of pensions, longer life expectancies and uncertainty about the future of Social Security make nest eggs ever more important. Late last month, the U.S. Government Accountability Office released updated retirement security estimates based on its analysis of household financial data from the Federal Reserve’s 2016 Survey of Consumer Finances. An estimated 29 percent of households aged 55 years old and older had no retirement savings and no defined benefit plan at the time of the survey, according to the March 2019 report. That number has not improved since the last time the agency studied the issue in 2015. The agency reports add to a growing body of research that forecasts rough times for baby boomers and Gen Xers, who are increasingly seen as unlikely to be able to afford retirement. 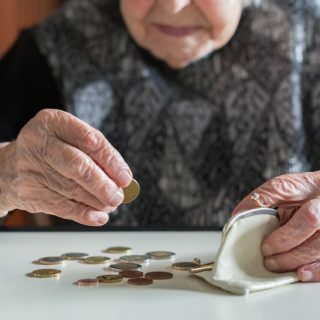 A total of 48 percent of households aged 55 years old and older had no retirement savings, according to the 2019 report. This represents an improvement over the 52 percent in the 2015 report. Just 26 percent of households in the 2019 report had retirement savings and a defined benefit plan, an increase of 1 percentage point compared to the 2015 analysis. The 2015 analysis found that among households with some retirement savings, the median amount of savings was roughly $104,000 for households ages 55 to 64, and $148,000 for households ages 65 to 74. Those savings, the report says, are equivalent to an inflation-protected annuity of $310 and $649 a month. A 2017 study by the Schwartz Center for Economic Analysis found 35 percent of all workers who were between the ages of 55 and 64 did not have retirement savings accounts or pensions. For workers in that age group who did have retirement savings, the median account balance was $92,000. When those without savings were included, the median savings account balance of workers who were getting close to retirement age was $15,000, according to the 2017 report. The researchers concluded that most workers face declining living standards or poverty when they retire. Low-income workers are at high risk of falling into poverty, the report says. Millennials face their own set of challenges as well as some advantages in saving for retirement, according to a March 2019 report by researchers at The Brookings Institution. According to the report, the millennial generation was born between 1981 and 1996. By 2050, they will be between 54 and 69 years old. They will make up roughly 25 percent of the population in 2019 and will surpass baby boomers as the largest living generation in the United States. Millennials have accumulated less wealth than their predecessors at the same age. They are more likely to delay things like parenthood and home ownership. But they have the most formal education of any generation in history. More than 60 percent of millennials have attended at least some college compared to 46 percent of the baby boomer generation at the same age. Higher education rates will enhance the ability to save for retirement, partly by enabling higher wages and less physically demanding jobs that allow for more time in the workforce. So while millennials face headwinds in their ability to save for retirement, it’s not at all clear that they will struggle as much as baby boomers before them. Millennials also stand to benefit from reforms that may spring from the failures of baby boomers to plan their own retirements. The issue has caught the attention of lawmakers from both parties, who are considering bills that would make it easier to save for retirement. The bills do little, however, to address the needs of those who are currently closing in on retirement with little or no savings. On April 2, 2019, the House Ways and Means Committee passed the Setting Every Community Up for Retirement Enhancement Act, or the SECURE Act for short. Among other things, the legislation increases the age for required minimum distribution (RMD) from retirement accounts. Retirees are currently required to withdraw money when they reach age 70.5. The SECURE Act increases that age to 72. The legislation also opens 401(k) participation to part-time employees. Further, the act encourages employers to automatically enroll workers in 401(k) plans and prohibit plans from making loans to employees through credit cards. The committee’s chairman, Democrat Richard Neal from Massachusetts, is also proposing legislation that would create a new agency within the Treasury Department to issue bonds to finance loans to failing multi-employer pension plans. The Senate Finance Committee is considering the Retirement Enhancement and Savings Act of 2019, also known as RESA. It’s cosponsored by Republican Chuck Grassley of Iowa, who chairs the Finance Committee, and Democrat Ron Wyden of Oregon, who is the ranking member. The Senate bill would ease the way for small employers to join together to offer retirement savings plans for their workers. It would also allow workers to make IRA contributions past the age of 70.5, which is not currently allowed. And it would make employers provide estimates to employees of how much their accounts would provide in retirement income if invested in an annuity. The Senate bill would also make it easier for employers to offer the option to employees to invest in lifetime income arrangements such as annuities. And it would enhance the ability of employees to transfer retirement plan contents to a new plan when they change jobs. The bill would also encourage increases in retirement savings by automatically increasing contributions to 401(k) plans.